Are you new to Crystal and bought a home? New homeowners can file for a homestead credit on their property taxes at Crystal City Hall during business hours (Monday – Friday; 8 a.m. – 4:30 p.m.). The deadline to own and occupy is Saturday, Dec. 1; the filing deadline is Monday, Dec. 17. The Homestead Application Form is available at bit.ly/2ON2bcr. For more information, contact assessing/customer service specialist at 763-531-1118 or gail.petschl@crystalmn.gov. Since we’ve had an early start to winter, put Saturday, December 1 on your calendar for our annual Winterfest! This free event from 10:00am to noon features music and entertainment along with free activities inside and outside the Crystal Community Center. Activities include: visiting with Santa, make and make crafts, horse-drawn wagon rides, DJ music by Kidsdance, outdoor petting zoo and more! See what other great winter activities are offered at Crystal Recreation. Get more information here. Our famous and much-appreciated police K9 Rocco retires at the end of this year. 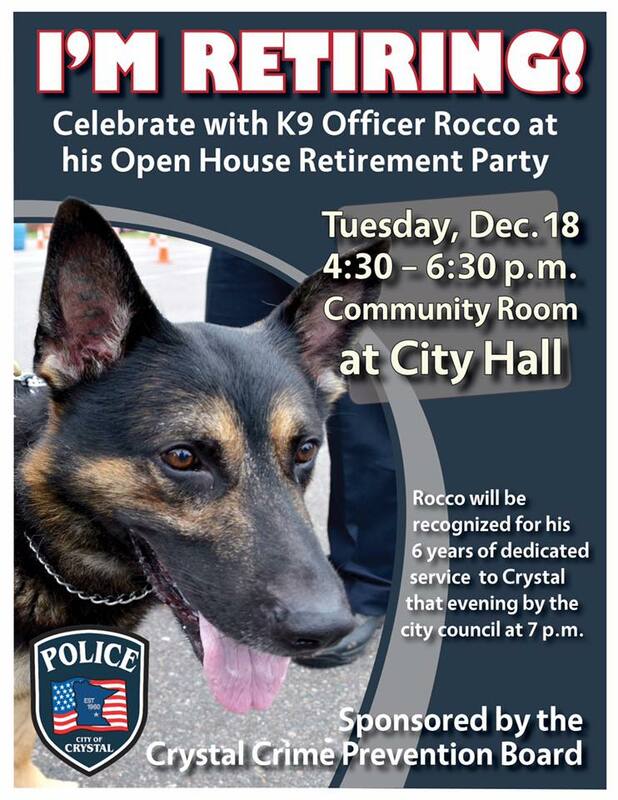 Join us to celebrate his service to Crystal on Tuesday, Dec. 18, 4:30 – 6:30 at City Hall. Crystal will be “hiring” a new K9 in 2019. Speaking of dogs, Crystal no longer requires dog licenses. City council made a change to our ordinance this year. Rabies vaccinations are required, so keep a rabies tag on your dog’s collar and/or proof of vaccination with you in case of emergency. 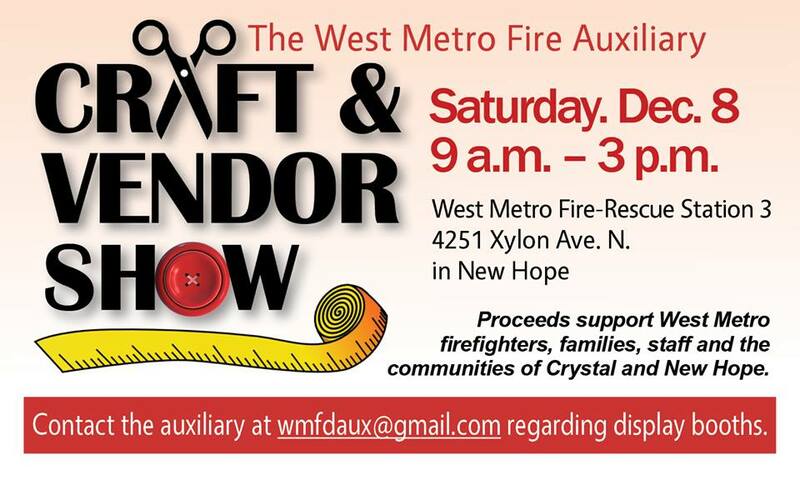 West Metro Fire Auxiliary is hosting a Craft and Vendor Show on Dec. 8 at Fire Station 3. Proceeds support WMF firefighters, family, staff along with Crystal and New Hope communities. Enjoy November and have a very Happy Thanksgiving! 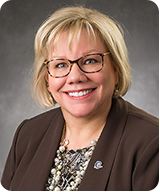 For council meeting updates, visit my recap page — and City of Crystal’s website to view meetings and council packets. I represent Section 1 (Wards 1 & 2) in Crystal, Minnesota. Contact me here.